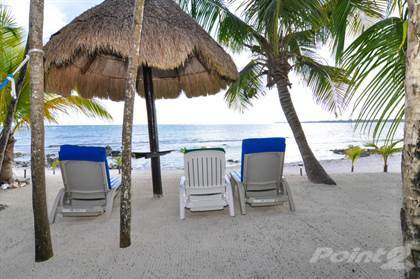 Gorgeous Beach Home on Tankah Bay\r\rLocated on one of the most spectacular white sand beached of the Riviera Maya this enchanting 3 bedroom beach home has 3 bathrooms and a half bath and a separate 1 bedroom guest home built for easy the addition of a 2nd floor. This stunning villa is perfect for use as a vacation rental or as a year-round residence.\r\rOnly 5 miles north of Tulum and approximately 30 miles south of Playa Del Carmen this luxury beach villa is located on a quiet bay area within a private beach side community. This property boasts the title of Federal Zone Concession, meaning it has a private beach that can be constructed upon per government regulation, giving this property a highly prized attribute and an extra possible future income. \r\rWith large picture windows and high ceilings this fantastic beach villa not only has a spectacular view of the turquoise beauty of the Mexican Caribbean Sea, it is also bright, open, and airy feeling inside. You and your guests will enjoy relaxing with an evening cocktail on the rooftop lounge with full wet-bar or enjoying a shared meal in the spacious dining area and gourmet style kitchen. \r\rWhether you prefer to frolic in the gentle surf, walk along the long stretch of beach around the bay, or explore the spectacular reef teeming with colorful tropical fish and sea turtles, you are sure to not run out of activities or places to explore. There are 2 small restaurants nearby and a beautiful cenote within walking distance. The entire Riviera Maya is full of exciting eco-parks, ancient Mayan ruins and jungle adventures and your beach home in paradise is nestled in the midst of this natural wonderland. \r\rContact our agents today to see this breathtaking beach villa for yourself! Hi, I'd like to find out more information about Caribbean Soul. Thanks so much!